In the second of a series of posts on the proposals of Wellington 2040’s vision, we thought we should look at the concept of Laneways. The picture chosen to illustrate this is the refurbishment of Opera House Lane, which sort of ties in with our previous post – and shows the “after” picture of how the Lane could be. I don’t have a picture of the Lane in its present condition, and I suspect that we don’t need it: we all know how horrible it is. Unpleasant is too mild a word. The Lane exists at present of course, but is made particularly unpalatable by the preponderance of smokers to smoke there, of urinators to urinate there, of muggers to mug there (at least that’s how it feels), and certainly of taggers to tag there. As evidenced by the visual, what would make this whole Lane experience nicer is to have shops and cafes opening out onto the footpath of the Lane – an admirable and noble intention, and a far better use of the ground space of the building recently vacated by the Tax Department and the shoe shop. What it needs of course is a whole mess more of people, in real life, and what that implies is that there are lots of people here going to and fro – ie both to the waterfront and back to the Te Aro Park. These images from the Council are an interesting series – far from the usual sophisticated Stantial Studio images favoured by Athfield Architects and others, the Council images are roughly built Photoshop mashups, most of them featuring this slightly dorky guy on a bicycle, or Miley Cyrus going for a jog. She gets around, that woman. There’s also a slightly drunken guy in a pink shirt who is stumbling, about to trip up on the crazy paving on his way into the inviting pub that nestles halfway down the lane. But this mashup sensibility works well here, with the existing mural on the wall of the Opera House still visible, and the out-dated plastic bubble roof down the lane replaced with a series of slightly broken slats letting in the wind, rain, and occasional shafts of sunlight. In return, lush creepers grow up the wall, entangle themselves along the ceiling, and climb out into the sun. But there is of course another side to Laneways, and that is their well-known affliction / predeliction for Graffiti. Some good, some bad, some excellent. Some shown right here…. 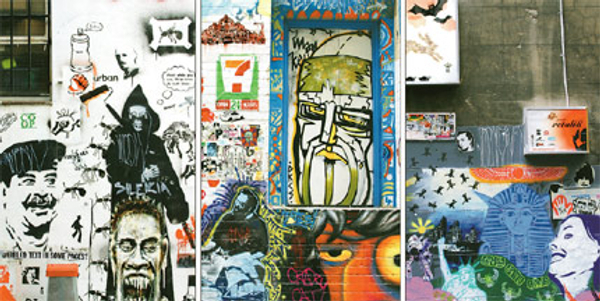 If you’re interested, there is a good article on the origin of the current laneway street-art scene, from The Age in 2004 here. Of course, this is at odds with the recent actions of the WCC, where they recently closed off and painted over Wellington’s only existing laneway. Not a good start really, although that was a particularly narrow, particularly smelly little alley. Let’s see if we can make this one work a little better! And blossom it has. 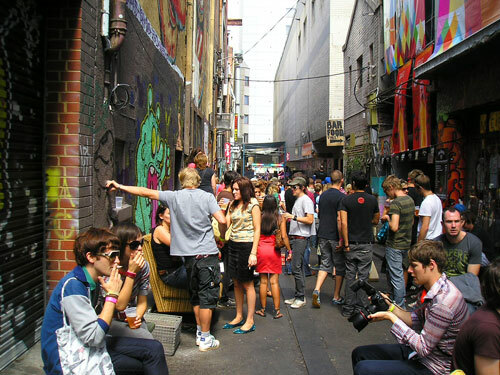 The Laneways in Melbourne are now home to a well-attended Fashion Festival as well as the Music Festivals. 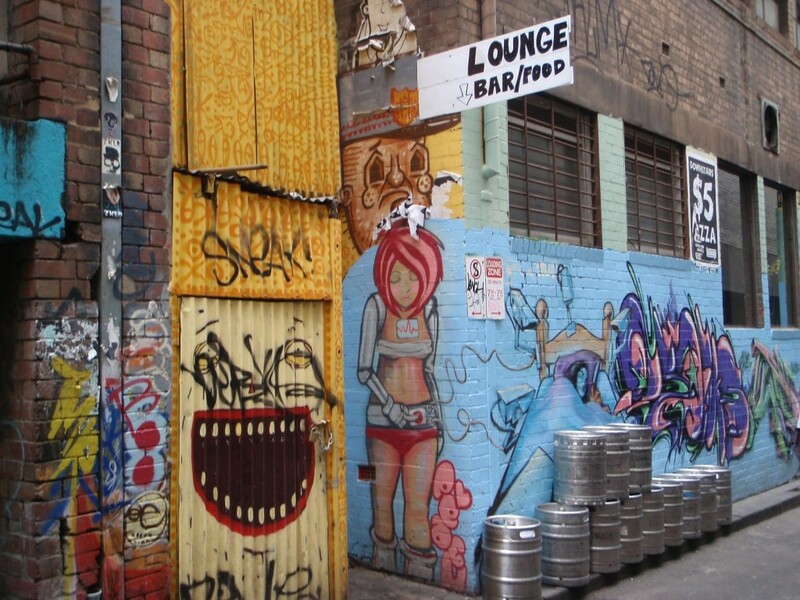 It’s a wonder that anyone is left to walk the main streets of Melbourne, given that so many hipsters appear to be hanging out down the side streets. Roll on the roll out of the Lane Way! Can we make this happen soon? Like, perhaps, by Christmas 2011? I’m struggling to imagine Opera House Lane being an inviting place. Part of the reason Melbourne’s laneways work is that Melbourne is hot for a big chunk of the year and the laneways are in shadow. That makes al fresco dining or drinking an attractive prospect. Wellington isn’t ever hot. Look at the top picture with the couple sitting at the circular table. They have one of those gas heaters on poles behind them. They need that to keep them warm, even tho the pedestrians are dressed in summer clothes. Why are they sitting in a lane which is still cold and gloomy when Finc is just around the corner, there are about fifty cafes in C-Place, and they could enjoy a beer in the sunshine at St Johns? Maybe they’re taggers taking a break, or they’re perverts hoping to watch some public urination? All of which is a perfectly valid comment Mr P, to which i have no valid answer. But what if the Lane was not cold and gloomy, but the local hangout of rock musos and ballerinas? If dancers stretched their limbs there while guitarists stretched their strings? The most unlikely places can become popular given the right dose of human life, and careful design. Look at Chow, Alice, and the Library. Reuse of underloved alleys can work in the right hands. 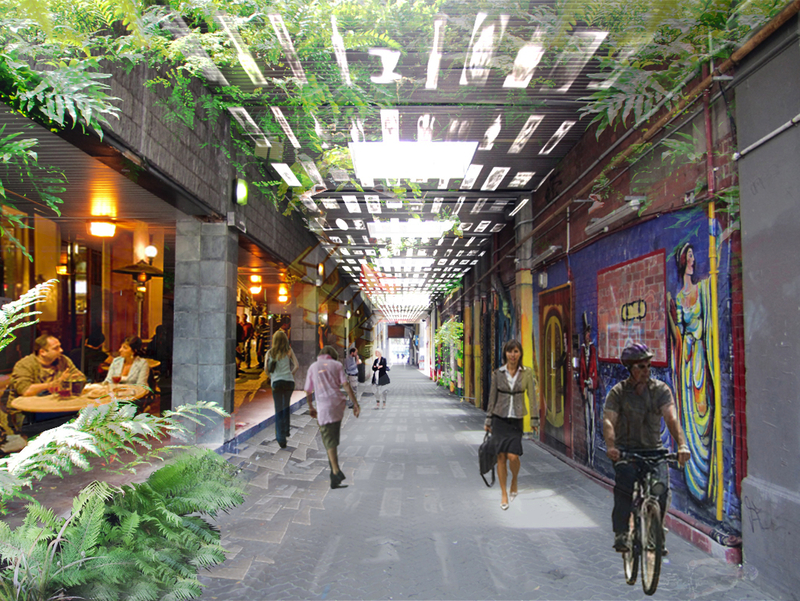 I think maybe a covered linear arcade is a better solution for Wellington. I know that turns it from a public in to a private space, but does that matter if it is attractive and usable 12 months a year? A few posts ago I commented about the ugly carpark that’d be visible from the proposed apartments on Taranaki St. One of the problems with Opera House Lane is the grotty other end of the same carpark. I think the carpark is part of the problem and there are much better things you could do with such a vast site. Duxton is ugly. Bulldoze them both and replace them with something cool. It’s interesting looking at the pictures (and my own memories) of Melbourne as it’s very difficult to identify specific urban design/architectural elements that make them successful. I have a hunch that a significant part of it is cultural critical mass, that is that they are now so accepted that even the bleakest laneways are accepted in the larger family of “cool” urban experience. So how do you break that barrier into a cultural norm? There are certainly plenty of places for an improvement on this experience in our city – Opera house lane being only one. A huge one would would be fixing the link between west bank and victoria street. We have a pretty good little side street which had two outlets. One was a truly urban experience which has since been painted over and the other is through a loading dock. As a general rule I’d say that an “urban” experience will be embraced regardless of architecture as long as 3 things are absolutely missing. Urine, vomit, and garbage. Every carpark stairwell, alley/laneway, or service corridor tells us this. Designers can do some fantastic things with dark spaces, in fact those become the intriguing desirable places (such as our own Motel). However when one is expected to tolerate the stench of those three it becomes very difficult to make a convincing argument as an urban space occupied at other times other than midnight until 5 am. My sense is that covered or not covered doesn’t matter so much. We have a freaking idiotic fountain in our city that dumps water which is caught by the wind and sprays it into our faces by our relentless wind. How this every was considered a good idea, I have no idea, but it does manage to find a place in people’s hearts. So I think a roof structure with openings would probably be fine. Resolving the rubbish/waste issue seems to me to be critical. Maybe someone can provide some insight into the little christchurch development that is similar in scope. Can’t recall the name as I’ve only been really to CHCH once, but there was a little area that despite a somewhat contrived feel still managed to be well occupied and appealing. >We have a freaking idiotic fountain in our city that dumps water which is caught by the wind and sprays it into our faces by our relentless wind. You say that as if it is a bad thing, while I think that is the best part about the fountain. Regarding your 3 things that disqualify an embraceable urban space… I’ve been on a mission to photograph Wellington from unusual angles recently. One of the best places to see the city is from the roofs of parking buildings. A few weekends ago I stumbled across a large group of teenage girls in the stairwell at the top of the parking building attached to Readings. One person’s urine soaked mugger danger spot is another person’s perfect place to hang out with your friends and avoid your parents. davidp I am curious how you find the assault of the bucket fountain to be one of its charms..
as for the readings stairwells. I was just there and walked up the stairwell. It was very non-urine scented. In fact it had no scent at all. So I stand by my claim. Jason – short and to the point, thank you. I should take this moment to point out that this Laneway is only one of the many that the 2040 vision proposes – it identifies a number of smaller connecting paths between larger streets, so that the city is more porous. This particular Lane is of the most interest however, as it is on a key route from the city down to the waterfront. I read the “vision”. They’re going to plant some trees on Kent Terrace and put a park outside Baby Factory. I can’t fault the intention – those are the sorts of things we should want to do, and realistically, this is a first draft – but it shouldn’t take 28 years. RE: smaller connecting paths: Council’s strategy until now, and even recently, has tended toward killing smaller connecting paths. They recently closed off the “graffiti alley” between Ghuznee Street and Left Bank Arcade, for example. I can probably think of three or four within a few hundred metres of my apartment that could be “opened” (i.e. guaranteed 24/7 access) before the Rugby World Cup. Look at the ridiculous fence underneath the National Office (between Victoria and Glover Streets); you can access both sides of it, but if you want a coffee at People’s you have to walk round the block. Try getting to Havana Bar from Vivian Street after 7pm – there’s a 50% chance that gate will be closed. How many people actually use the Holland Street – Taranaki Street pedestrian route through the church? 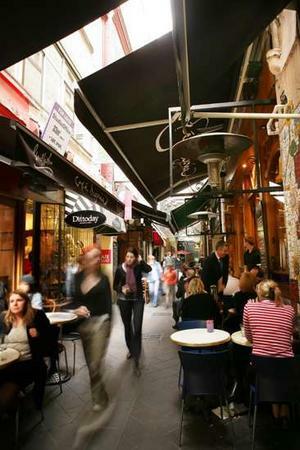 You can work on the aesthetics later (though usually they’re easy: lights, seats, rubbish bins, plants) – first get people in the habit of using the space, get some ownership, and then encourage businesses with street frontages. Less short and to the point this time, but I usually am when I’ve been drinking. No doubt this comment could use some editing. I popped in to the WGTN2040 in Pigeon Park on the way home last night. There were a handful of copies of the full 150page report. The young woman keeping an eye on the exhibit and encouraging public feedback wasn’t sure whether they were give-aways or not, but was happy for me to take one. There is a huge amount of information in the document. Fish readers might want to get a copy before they’re all gone. As minimus noted above a few laneways have popped up in Christchurch in the last few years and the City Council has done some work on looking at where other lanes could be developed. 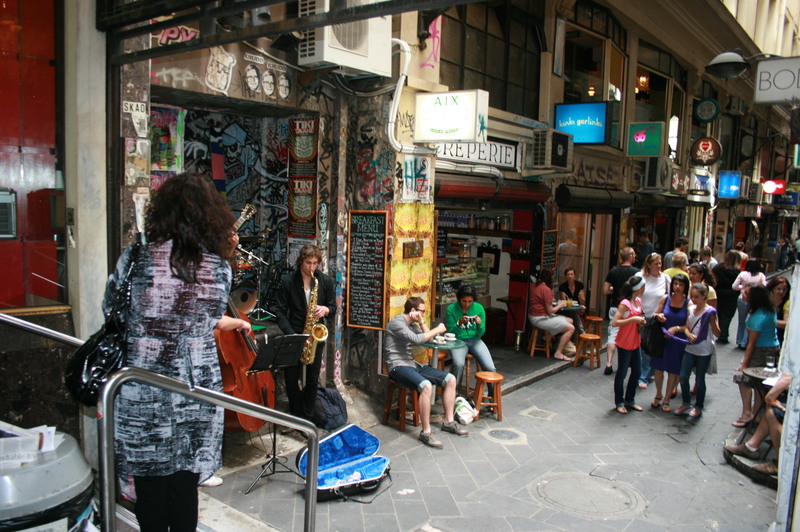 Struthers Lane / SOL Square was probably the best example although the retail shops did struggle as they were too far out of the way to get regular custom and enough people walking past, window shopping etc. The bars and cafes seemed to do ok though. Of course they are all in ruin and red zoned now… but maybe in the rebuild some new laneways will develop… here’s hoping.